Frederick Center for Research and Education in Science and Technology (CREST) aims to provide access to STEM-based undergraduate and graduate degree and certificate programs offered by partnering colleges or universities in response to the needs of local industry. CREST also seeks to facilitate research partnerships and drive technological business development in the Frederick region. Frederick National Laboratory (FNL) and Frederick CREST recently signed a three-year memorandum of understanding to establish a mutually beneficial collaboration that will integrate education and research in current and planned programs sponsored by CREST. CREST is hosting classes locally that are within the curriculum of the Master in Chemical and Life Sciences program provided by the University of Maryland, College Park. The curriculum is aimed at enhancing the qualifications and skills of public-school science teachers, including a hands-on science component. 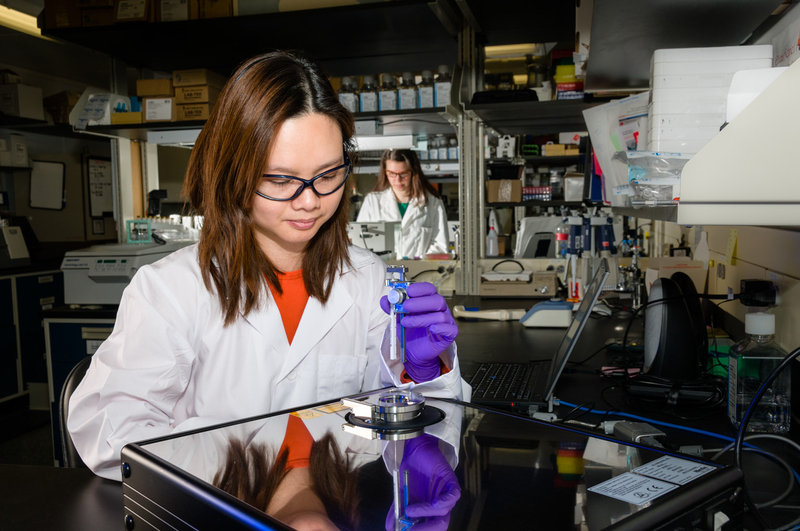 Under the new partnership, Frederick National Laboratory and CREST will work to provide training for University of Maryland graduate students in FNL laboratories. CREST also intends to sponsor Frederick-based classes in other relevant areas of interest, which could include workshops or seminars led by FNL scientists, and FNL scientists may be eligible for future adjunct positions within the University of Maryland master’s program. CREST plans to provide targeted training offerings for FNL employees. Additional potential joint activities as part of the partnership include opportunities for students to participate in collaborative research efforts with university faculty and FNL scientists, which may also include FNL employees formally teaching courses at a participating university. The national laboratory will offer speakers for targeted seminars, conferences, and workshops through CREST. “We are delighted to partner with Frederick CREST to engage local academic institutions in training the next generation of research scientists, while also providing meaningful research and education opportunities for our own employees,” said Ethan Dmitrovsky, M.D., laboratory director of the Frederick National Laboratory and president of Leidos Biomedical Research, the laboratory’s current prime contractor and signer of the agreement. "It is with great pleasure that we are formalizing this partnership with FNL. Together we plan to expand educational opportunities in science, engineering, and computation in the Frederick region, while helping to drive our technological industries. Jointly we can help to push Frederick forward to become a vibrant tech hub, where education and research create value and address critical issues," said CREST Executive Director Joanne Horn, Ph.D. The partnership follows collaborations signed earlier this year by the national laboratory with Georgetown University, Hood College, the National Cancer Institute of Mexico, Mount St. Mary’s University, and Howard University. The agreements are part of a concerted effort by FNL to expand its commitment to educate the next generation of scientists and foster academic research collaborations. The Frederick Center for Research and Education in Science and Technology is a non-profit organization formed by state legislative mandate under the Maryland State Department of Education. CREST is tasked with providing science and technology educational programs to the Frederick region that respond to the needs of local industry. CREST thus partners with the larger Maryland public research universities to offer programs not available through local institutions. CREST also facilitates joint research collaborations, and offers workshops and seminars to foster exchange, as well as providing an array of public services.